ABC's Live Streaming Aimed At Keeping Cable Cords Intact : All Tech Considered Starting Tuesday, ABC will let viewers in New York and Philadelphia watch their local stations over the Internet. But this is not a way to cut your cable bill. The new Watch ABC service will require a cable account to log in. 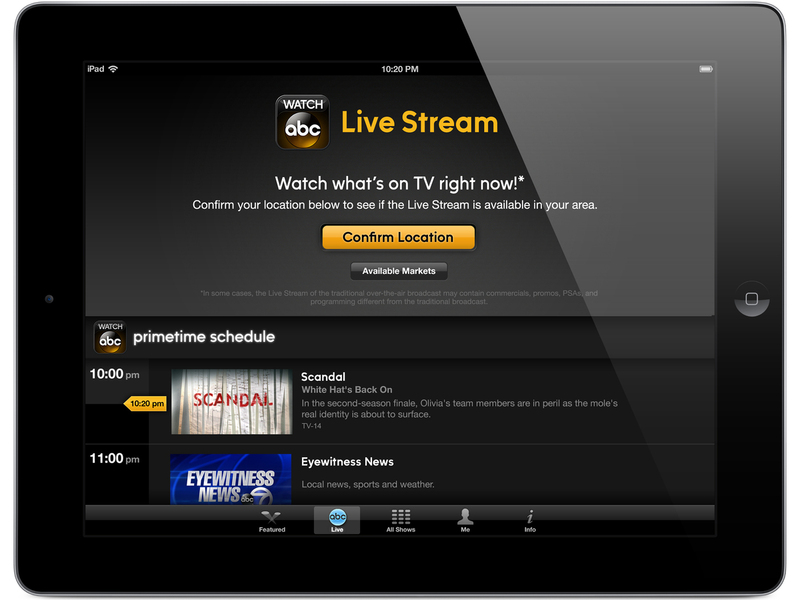 A new iPad app lets viewers watch live ABC programming starting Tuesday in New York and Philadelphia. There's another way television is moving online. Starting Tuesday, ABC will let viewers in New York and Philadelphia watch their local stations over the Internet. But this is not a way to cut your cable bill. NPR's Dan Bobkoff discusses the change with All Things Considered co-host Audie Cornish. "Starting Tuesday afternoon, if you live in the New York City or Philadelphia markets, you'll be able to fire up a free app called Watch ABC and stream your local station as if you were watching it on TV. The app will be available for the Apple iPhone and iPad as well as the Kindle Fire. Or you'll be able to watch at abc.com. "ABC and other networks have long allowed you to watch their prime-time shows online after they air on TV, but ABC is the first broadcast over-the-air network to let you watch their live feed — including local news, daytime talk shows and prime-time dramas. "Over the next few months, it will expand to cities like Los Angeles, San Francisco and Chicago. Eventually, ABC expects most of its affiliates will be onboard." "Many people are starting to wonder if cable is worth keeping, and they're thinking of cutting the cord and going online only since they can get content from Netflix, Amazon and other places. Live streaming is a way the broadcast industry is trying to cement the system they've had in place for a long time, even as more people are watching TV and video online. So, they're going where the viewers are going, but they're scared that people are going to cancel their cable subscriptions." "What they've done here is they've forced you to log in to this app using your cable company's username and password, so they know you're a subscriber. Even if you're in the office or you're out of your home, they know who you are and that you pay for cable each month. "You could set up an antenna and get ABC over the air for free. But most Americans watch all the broadcast channels through cable. And cable's become a very important revenue stream for the local affiliates at ABC, CBS and NBC, which over the past few years have been demanding fees, per customer, from the cable companies. "When you pay your cable bill, you might actually be paying $1 per network, according to the media research firm SNL Kagan. For these local stations that have a big decline in advertising revenue, that's become a very important source of revenue. And by locking you into cable, they're trying to maintain that." "If you're in New York or Philadelphia, you'll be able to pull up this app on your smartphone or your tablet and you can hit the "Live" button and see more or less what you see on your TV from your local ABC affiliate. The biggest difference will be the ads — ABC says it has built in the ability to serve targeted ads. So they know who you are, they know what you like and, at least theoretically, you could get different ads than your friends eventually." "You can already watch a number of cable channels this way, including ESPN and CNN. But some of ABC's broadcast competitors are also expected to follow suit. There's some speculation around CBS, which has already invested in an online streaming company and that could help CBS launch something similar down the line."